August | 2015 | In Domino Spera! This Sunday, we wrap-up chapter 6 of John’s Gospel, the ‘Bread of Life Discourse’, as we continue with the core of Jesus’ explicit teaching on the Eucharist. You’ll remember that last week we looked at how Jesus was very clear, through repetition and strong language, that He was speaking literally to the crowds: unless you eat the flesh of the Son of Man and drink his blood, you have no life in you (Jn 6:53). Today our Gospel takes up right where we left off and continues this very conversation with the crowds. Once again, we see that the crowds have clearly understood that Jesus was being literal in asking them to eat His Flesh and drink His Blood. And take note of John’s change in language: no longer is he speaking about the crowds of anonymous followers; now John tells us it’s Jesus’ own disciples who struggle with His words and say, This teaching is difficult; who can accept it? (Jn 6:60). This question reinforces that Jesus is unmistakably saying that we must truly eat His Flesh and drink His Blood in order to have union with Him and divine life within us. I say this because, were Jesus only speaking figuratively, this question was an opportunity for Him to soften His teaching and change His words. ‘Relax, I’m only speaking symbolically’, He could have said… Jesus did just that for Nicodemus a few chapters earlier, when speaking of having to be born again (Jn 3:1-21, but especially vv. 3-5). But here, Jesus doesn’t correct His disciples — precisely because they haven’t misunderstood! Rather, Jesus again continues to push the point: Does this offend you? Then what if you were to see the Son of Man ascending to where he was before? (Jn 6:61-62). In other words, ‘you think this is difficult because you don’t realise who I am(! ); if you knew that I am God, then you would accept my words and see that this is indeed true and possible…’ This will be part of Peter’s answer at the end of our Gospel (v. 69). God said, … ‘Let the earth bring forth living creatures … And it was so. God said, ‘Let us make humankind in our image, … And it was so (Gen 1:1-26). And again, in the Psalms: By His word the heavens were made, by the breath of his mouth all the stars (Ps 33:6). My brothers and sisters, God’s Word is alive and active: it brings into being what it says. And so, at the Last Supper, when Jesus said the words of institution — this is my Body… this is my Blood —, through the power of His Divine Word, the bread and wine became His Body and Blood. And it’s this same mystery of the power of God’s Word that continues to act for us today in the Mass. Every time I extend my hands over the bread and wine, I do so to call down the Holy Spirit so that when I give my voice to Jesus to speak once again those very words, the Spirit transforms them, according to the words of Jesus, into the very Flesh and Blood of Jesus, crucified and risen. My brothers and sisters, our faith in the Eucharist as being truly the Body and Blood of Jesus rests solely on the authority and power of Jesus’ words. We believe because He said it would be so. This is why to believe in the Eucharist requires an act of faith: we must have faith that Jesus is who He says He is and that He has the power to do what He says He will do. This is what Jesus is getting at as He continues His answer to His disciples: It is the spirit that gives life; the flesh is useless. The words that I have spoken to you are spirit and life (Jn 6:63). Jesus isn’t here undoing His previous statements; this isn’t Jesus telling us that it’s all just a metaphor. Rather, Jesus is precisely pointing us to the power of His word and His authority as being rooted in His divine nature: ‘The words that I have spoken to you are spirit and life, because they are the Word of God! You cannot understand them by using the natural senses of the flesh, but only with the spiritual senses of faith’. This is why Jesus says again, For this reason I have told you that no one can come to me unless it is granted by the Father (Jn 6:65). In other words, Jesus acknowledges that indeed it’s a difficult teaching, one that requires faith and trust in God in order to believe and understand. If we rely only on our physical senses, then we’ll see nothing more than bread and wine. But if we allow the Word of God to dwell in our hearts and strengthen our spirit, then we’ll come to recognise that it is indeed Jesus Himself who is present before us, hidden under the appearance of Bread and Wine. Belief in the true presence of Jesus in the Eucharist requires an act of faith; or rather, it is an act of faith! For this reason, John tells us, many of [Jesus’] disciples turned back and no longer went about with him (Jn 6:66). This is the only place in the Gospels where we hear that some of Jesus’ disciple abandoned Him because of His teachings. So here again, had Jesus been speaking only symbolically or metaphorically He had an opportunity to correct their way of thinking… but He didn’t; He let them leave for their lack of faith in Him. How this must have saddened Him! 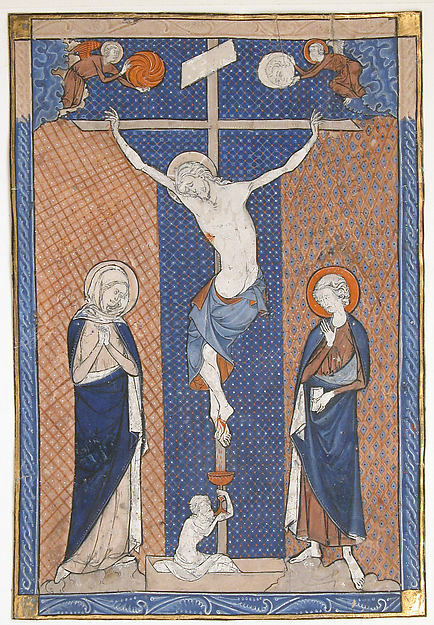 Page from a Missal, Tempera and gold on parchment, Paris, ca. 1270-80. And so it’s not by accident that Peter is the one who responds, both for the Apostles and for Christians of every age: Lord, to whom can we go? You have the words of eternal life (Jn 6:68). In these words, we get a sense that Peter and the Twelve also struggle with Jesus’ teaching, but since they know He’s the Son of God — We have come to believe and know that you are the Holy One of God (Jn 6:69) — they’re willing to overcome their lack of understanding by placing their faith in Him. In other words, ‘We, too, find this a hard teaching, but who else can we follow? Only you are the Son of God; only you are the Messiah, the Christ. If we stopped following you, we’d be lost and spiritually dead. We don’t understand, but we believe in you, and because we believe in you, we also believe your words’. That’s why Peter’s response is really a double act of faith: faith in Christ and faith in the Eucharist; faith in God and faith in the Word of God. And so one question remains: What will be our answer? Will we stumble on this teaching and turn away from Jesus, or will we stay close to Him, like the Apostles, and pray: Lord, I believe; help my unbelief! (cf. Mk 9:24)? I invite now to kneel. Lord Jesus Christ, we firmly believe that you are truly and substantially present in the Blessed Sacrament of the altar. Humbly kneeling before you, in union with all the faithful on earth, we adore you and worship you with all our heart. Grant, O Lord, that we, who declare our faith in this fountain of your love and mercy, may drink from it the water of everlasting life. Amen. Portion of ‘Christ on the Cross’, by Diego Velasquez, 1632. We continue this Sunday with chapter 6 of John’s Gospel, the ‘Bread of Life Discourse’, and now this week we enter into the heart of Jesus’ explicit teaching on the Eucharist, the most important section of the whole chapter. Since the crowds didn’t understand Him, Jesus now strengthens His language to clarify His meaning: I am the living bread that came down from heaven. […] and the bread that I will give for the life of the world is my flesh (Jn 6:51). Whereas before Jesus was using a spiritual language the crowds didn’t understand, He now switches to a more literal language so that they might understand. And we see that the crowds are beginning to do so: The Jews then disputed among themselves, saying, ‘How can this man give us his flesh to eat?’ (Jn 6:52). They understand very well that Jesus is speaking of having them eat His flesh. Here John uses irony again: though they understand His words plainly, the crowds, in fact, still don’t understand what He’s actually going to do. They now think He wants them to eat His living flesh, perhaps even at that moment. They hear Jesus’ words and immediately think of cannibalism, and this rightly confuses and even repulses them. They understand the what, but they don’t understand the how. But notice Jesus’ careful choice of words: He didn’t say ‘the bread that I am giving is my flesh’, but rather, the bread that I will give … is my flesh (v. 51). The giving of His flesh for food is a future gift, not a present one. At the Last Supper, Jesus will change this to the present tense when He gives the Apostles His Flesh and Blood as bread and wine: ‘Take, eat; this is my body. […] ‘Drink from it, all of you; for this is my blood (Mt 26:26-28; cf. also Mk 14:22-24; Lk 22:19-20; 1 Cor 11:24). You see, the Flesh and Blood that Jesus gives us to eat isn’t the flesh that was living at the time He spoke these words to the crowds, but His crucified, risen, and glorified Flesh. The gift of the Body and Blood of Jesus, while instituted at the Last Supper and given to us on the Cross, in a sense, only becomes the Eucharist after the Resurrection. Had He given us His flesh to eat before that, we could rightly ask with the crowds, ‘How can this man give us his flesh to eat?’ (Jn 6:52), for once having eaten Him, there would be nothing left: He would be consumed. Rather, Jesus is pointing us precisely to the Cross and Resurrection. 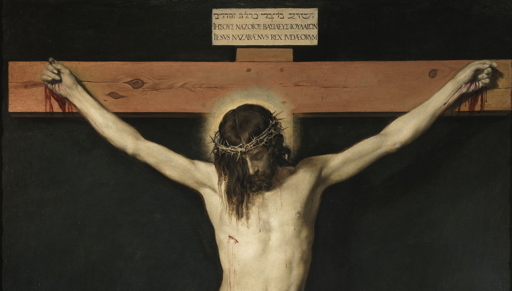 First, He’s pointing us to the Last Supper, where gives us the gift of His Flesh and Blood in word, and then literally gives us His Flesh and pours out His Blood on the Cross — (this is also where the Sacraments of Marriage and the Priesthood intersect with the Eucharist, but that’s for another time). It’s in this moment that He gives His Body and Blood for the life of the world — that is, in atonement for our sins, for our redemption and salvation; that we might once again have access to eternal life in God’s presence. Second, it points us to the Resurrection, where His Body now has eternal life; death has no more power over the Body of Jesus. And, as we see for the Resurrection accounts, neither do the laws of physics: Jesus appears and disappears, and He even ascends into Heaven with His Body (cf. Mk 16:19; Lk 24:13-31, 50-53; Jn 20:19-29; Acts 1:9). Not being bound by death, space, and time, after the Resurrection Jesus is able to give us His Flesh and Blood without being Himself destroyed — this is part of the meaning of the miracles of multiplication. Since He’s conquered sin and death with His Body, He’s able to give us His eternal and divine Body and Life so that sin and death will be destroyed in us. This is also contained in the phrase for the life of the world (Jn 6:51): in the Eucharist, Jesus gives us life, His life. But going back to our Gospel text: instead of correcting their mistaken understanding, Jesus actually intensifies His language, repeating the same phrase five more times in our Gospel passage (Jn 6:53-58)! And not only this, but Jesus now changes the word He used for ‘eat’ from the usual term for eating to the more graphic term, ‘chew’, usually only used for animals. (Here we have a beautiful link to the Nativity: He who was to become our Food already pointed to this as a newborn by lying in a manger, an animal trough!) There is no room here for symbolism or metaphor! Jesus is very clear that He is being literal in His words: we must indeed eat His flesh and drink His blood! And in this repetition, Jesus also mentions that those who eat and drink His Flesh and Blood will share in His life: [as] I live because of the Father, so whoever eats me will live because of me (Jn 6:57). To receive the Eucharist is to participate in the very life of Jesus. That’s why we call it communion (union with), because in receiving the Body and Blood of Jesus, it’s He who lives in us, and us who live in Him. Again, since it’s His glorified Body we receive, it isn’t He who’s consumed in us, but rather we who are consumed in Him, to be increasingly re-created in His image and likeness. This is the true ‘personal relationship’ to which Jesus invites us! That’s why we speak of the Eucharist as the source and summit of the Church: it’s in the Eucharist that we’re united to Jesus and to each other, thereby being made Church; and it’s in the Eucharist that we express most profoundly the mystery of being God’s People, by being joined to Jesus in His offering of love to the Father. As Christians, we’re made by the Eucharist, and made for the Eucharist! I invite you now to kneel. We continue this Sunday with chapter 6 of John’s Gospel, the ‘Bread of Life Discourse’. Once again, John tells us how the people refuse to believe what Jesus is saying to them; they refuse to see beyond mere appearances to see the truth that underlies them: Is not this Jesus, the son of Joseph, whose father and mother we know? How can he now say, ‘I have come down from heaven’? (Jn 6:42). Precisely because they only see Jesus as a mere man, they can’t believe His words. They still only believe that He is a Prophet like those before Him; they don’t believe — and therefore can’t understand — His divine origins. This reminds us of Jesus’ dialogue with Nicodemus in chapter 3 (Jn 3:1-21). The crowds are only hearing and seeing with their human senses, with human logic, and not with spiritual senses or looking to understand God’s logic. And yet, again, this lifting up of the heart and mind to God is precisely what Jesus is trying to awaken in them. As I mentioned last week, faith is what Jesus is trying to arouse in them; faith is what will allow them to see beyond the mere physical to reach the spiritual realities. So that begs the question, then, what is faith? Jesus tells us, No one can come to me unless drawn by the Father who sent me (Jn 6:44a). This tells us that faith is first and foremost a gift: God is the one who gives us faith as He draws us to Himself; it isn’t something that we give ourselves or even something that we take. But we mustn’t be simplistic with what this means: we can’t go around saying, ‘Well, I don’t believe because I just haven’t yet received the gift of faith’ as if it’s something that’ll fall out of the sky someday. If we take the time to read the Bible, specifically the ongoing story of our relationship with God, and really listen to it, we’ll come to understand that from the very beginning God has been drawing us to Himself. That’s why He created us, and that’s why He continued to speak to us through His messengers and Prophets. God is constantly inviting us, drawing us to Himself; that’s why He sent His Son Jesus to come and bring us to Himself! Drawing us to the Father is precisely Jesus’ mission; salvation is the consequence of accepting this invitation and being one with the Father. Faith, then, is a gift in so far as it’s the invitation that God makes to us to be in relationship with Him. And it’s a gift because He initiates it. But that’s only the first part. For any invitation to bear fruit, it needs to be accepted! That’s why Jesus told us last Sunday, This is the work of God, that you believe in him whom he has sent (Jn 6:29). In order for us to have faith, we must accept the words of Jesus and believe that He is who He says He is; we must give Him the assent of our will. We need to accept that God wants us, that He has the ability to communicate with us, and that He has sent His Son Jesus to establish a relationship with us. Then, and only then, can faith begin to take root in us and grow. And so, in a sense, faith is also a choice. In the beginning was the Word, and the Word was with God, and the Word was God. […] He was in the world, and the world came into being through him; yet the world did not know him. He came to what was his own, and his own people did not accept him. But to all who received him, who believed in his name, he gave power to become children of God (Jn 1:1, 10-12). Unless we believe that Jesus is who He says He is — the God-made-flesh, the incarnate Son of the Father — then everything He says to us is useless. Jesus’ credibility is rooted in His identity, and, as He tells us Himself, He is the only way to know the Father (cf. Jn 14:6). That’s why Jesus continues, only the Son knows the Father and whoever believes has eternal life (Jn 6:47). Jesus will later clarify this at the last supper, And this is eternal life, that they may know you, the only true God, and Jesus Christ whom you have sent (Jn 17:3). All this is important, because unless we believe in Jesus, unless we give Him the assent of our will and have faith in Him, then we will not find credibility in His words. And unless we find His words credible, we will never come to believe that He means what He says: I am the living bread that came down from heaven. Whoever eats of this bread will live forever; and the bread that I will give for the life of the world is my flesh (Jn 6:51). 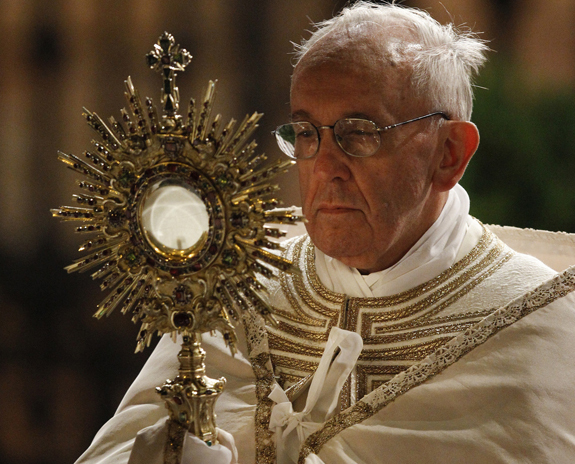 To believe in the Eucharist is to believe Jesus’ words. But in order to believe in His words we must accept them. This is why it’s so important for us to pray. As we’ll hear over the next two weeks, Jesus’ teachings are sometimes difficult to accept and it’s much easier for us to take the easy route and justify to ourselves that He’s merely speaking symbolically, or using hyperbole and exaggeration to make a point. Only in prayer, only by seeking out the one who seeks us, will we be truly drawn into the mystery of God, into the mystery of the Eucharist, into the mystery of faith. That’s why Jesus paraphrases the words of the Prophets Isaiah (Is 54:13) and Jeremiah (Jer 31:33ff): And they shall all be taught by God (Jn 6:45). There’s a double meaning in this verse: first, God is teaching them in that very moment through Jesus, the Son of God; and second, the Holy Spirit continues to teach us today in prayer. In prayer, God teaches us, heals us, strengthens our faith, and draws us ever deeper into Himself. Pope Francis carries a monstrance holding the Blessed Sacrament during the Corpus Christi observance May 30 in Rome. (CNS photo/Paul Haring) (May 30, 2013). On a side note, an excellent book to learn more about faith and how to grow in it, see The Gift of Faith, by Fr. Tadeusz Dajczer. Ps 78 R/. The Lord gave them bread from heaven. In our Gospel this week we continue with Jesus’ ‘Bread of Life Discourse’. Last week we introduced the scene with the multiplication of the loaves and fish. This miracle was followed by Jesus staying behind in prayer while His disciples took a boat to Capernaum across the sea. He later joined them by walking on water. The lectionary skips this section to focus on the Jesus’ teaching about the Eucharist. 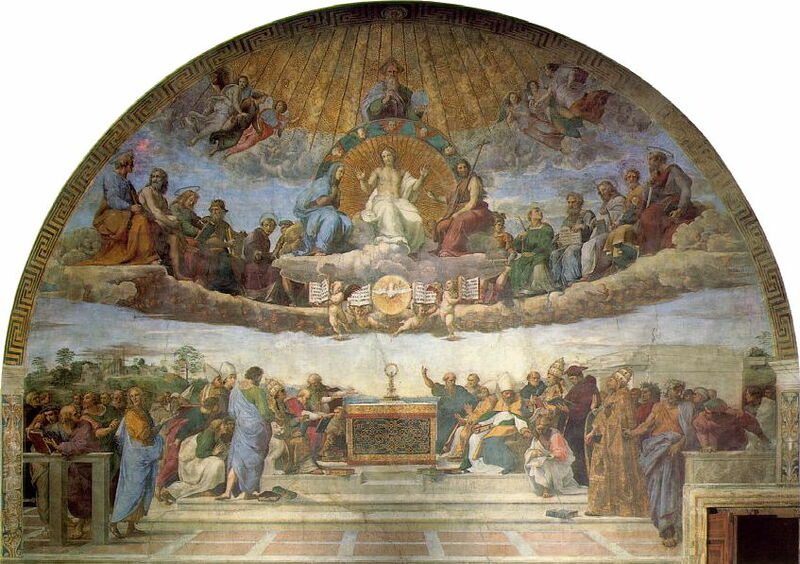 Disputation of the Holy Sacrament, fresco by Raphael 1509–1510, Apostolic Palace, Vatican City. Our Gospel today begins with the crowds, who took other boats back to Capernaum, surprised to see Jesus already there. They knew He had stayed behind while His disciples left, and they knew that He hadn’t taken a boat with them, so they were puzzled as to how Jesus got there, and so quickly. This is part of John’s use of irony: they know that Jesus somehow pulled off the impossible, but the crowds don’t understand. They witnessed the multiplication of the loaves, but don’t see what’s really happening. This’ll come up again in just a bit in verse 30. Continuing last week’s dialogue, Jesus challenges the crowds that they’re only following Him to fill their bellies (v.26). They’re impressed by His capacity to supply for their needs, but don’t understand what He’s trying to say to them through the multiplication. They want Him for what He can do for them, nor for who He is: Very truly, I tell you, you are looking for me, not because you saw signs, but because you ate your fill of the loaves (v. 26). On that occasion Jesus was speaking about water springing up to eternal life; here, he speaks of bread coming down from heaven to give life to the world. There, the woman was asking Jesus is he was greater than Jacob; here the people want to know if he can compare with Moses (The Navarre Bible: Gospel & Acts, notes on Jn 6:28-43). In other words, ‘Moses gave us manna, daily bread from heaven’, they said; ‘what can you do?’ Whether they forgot the miracle that just happened or were challenging Jesus to reveal more power, I can’t say, but again, it’s obvious that they just don’t recognise who Jesus is. You see, miracles don’t produce faith. They can strengthen faith, and even awaken a weak faith, but they can’t produce faith where it doesn’t exit. That’s because miracles never satisfy those who have no faith: they will always find ways to ‘explain’ them or always ask for more power to be shown. Miracles can never satisfy those who have no faith. And isn’t faith just what He wanted from them? In verse 28 they asked Jesus, What must we do to perform the works of God? He responded, This is the work of God, that you believe in him whom he has sent (v. 29). Notice how Jesus switches from the plural to the singular: the people asked, What must we do to perform the works of God?, and Jesus replies, This is the work of God, that you believe in him whom he has sent (vv. 28-29). Faith(!) is the work of God. But the people don’t understand because they don’t have faith. And faith is precisely what Jesus is trying to arouse in them, because faith is what will allow them to see beyond the mere physical to reach the spiritual realities that underlie them. So Jesus continues: it was not Moses who gave you the bread from heaven, but it is my Father who gives you the true bread from heaven (v. 32). Moses wasn’t the source of the miracle of the manna; he was merely the instrument that helped them to see that God was providing for their daily needs on their journey to the Promised Land. This daily bread was only a prefiguring of what God was going to do in the fullness of time: send His Only Begotten Son, Jesus, to bring life to the world (cf. Jn 10:10). And notice how Jesus switches from the past tense (it was not Moses who gave you) to the present tense (it is my Father who gives you); the heavenly bread is being given to them now. And Jesus continues to give us this heavenly bread today! That’s why Jesus says, For the bread of God is that which comes down from heaven and gives life to the world (v. 33). And what is that bread, or rather who is that bread come down from heaven? I am the bread of life, says Jesus, I am the food that endures for eternal life (v. 27). Whoever comes to me will never be hungry, and whoever believes in me will never be thirsty (v. 35). Ps 145 R/. You open your hand to feed us, Lord; you satisfy all our needs. If you remember, on Holy Thursday when we read the Gospel of John’s account of the Last Supper, John doesn’t speak much about the Eucharist, at least not explicitly. Instead of the Institution Narrative — which we have in the other three Gospels —, John gives us the washing of the feet. Now, that’s not because John doesn’t value the Eucharist! Rather, it’s because he had already given us a strong and profound eucharistic theology. In fact, he takes a whole chapter to do so — chapter 6, which has come to be called “The Bread of Life Discourse” —, and it’s this account that we begin to read today (and which we’ll continue to read over the next five weeks). Over these weeks, I want to unpack this event and discourse so that we can come to a deeper understanding of what John teaches us about the Eucharist, because it’s the heart of our Faith and what we do every time we celebrate Mass. This week, we only get a taste of this as we begin the discourse and John sets the scene for what Jesus will teach us. Throughout his whole Gospel, John works to show us how Jesus is the true Lamb of God who takes away the sins of the world and reveals to us the Father’s glory (cf. Jn 1:29; 8:31-36). In chapter 6, John puts all of this together in a powerful way as he leads us closer to the Last Supper and the Cross, the high point of Jesus’ self-revelation (His ‘glory’) and the moment of fulfilment of His mission. And notice the similarities of this scene with that of our first reading: Elisha also multiplied barley loaves to feed a crowd. 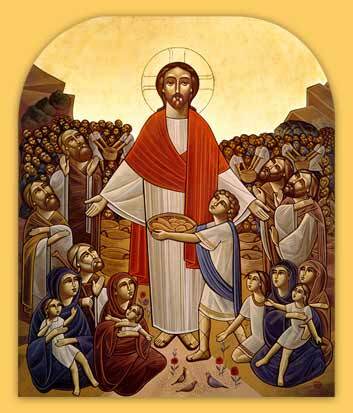 But Jesus feeds a much larger crowd (5000) with fewer loaves (5). Here John is telling us that Jesus is also a Prophet like Elisha, but a much greater Prophet (cf. v. 14). In verse 11, John writes: Jesus then took the loaves, and when he had given thanks, he distributed them… The word John uses here to say ‘give thanks’ is ‘eucharist’ — that’s what the word Eucharist means, to ‘give thanks’. This points forward to the Last Supper when Jesus will again say and do the same: after giving thanks he gave it to them (Mt 26:27; Mk 14:23; Lk 22:19; 1 Cor 11:24). Lastly, notice, how in our final verse today, the people don’t get it: they were about to come and take him by force to make him king (v. 15). They wanted to make Jesus king not because of who He was, but because of what He had done: He fed them; they wanted to make Him king because He filled their bellies (cf. v. 26). They only saw the outward sign, but didn’t understand the inward reality; they saw the power to multiply, but didn’t see the God who stood in front of them, veiled in the appearance of a man. In this, too, John is pointing us toward the Eucharist, which is the true Flesh and Blood of Christ, the true and real presence of God in our midst, veiled under the appearance of bread and wine. This opens for Jesus the opportunity to explain what He will do in the Last Supper and on the Cross. May it also open for us a journey into the Heart of Jesus to see beyond mere appearances, beyond the veil of appearances, to recognise the true and abiding presence of Jesus, the God who loves us and gives Himself to us so that we might have life in Him and have it in abundance (cf. John 10:10).